Today, Verizon announced 36 finalists from a pool of over 1,400 candidates from around the world for the 2015 Powerful Answers Award program — a competition that challenges innovators, developers and entrepreneurs to provide innovative solutions that deliver social good. Now in its third year, Verizon’s Powerful Answers Award offers a total of $6 million in cash prizes, plus the opportunity for winners to participate in an Accelerator program designed to help develop their ideas and bring solutions to market faster. The program finalists — who come from diverse backgrounds and represent 10 different countries — are set to present their ideas before judges next week, competing for a prize of $1 million in three categories: Transportation, Emergency Response and the Internet of Things. The winners will be announced Dec. 9. GreenBiz Group has selected 12 startups that will compete in VERGE Accelerate, a program hosted by VERGE 2015 that assembles a lineup of innovative early-stage companies operating at the intersection of technology and sustainability. Historically serving as a launchpad for entrepreneurs who have engineered a unique solution to a sustainability challenge, VERGE Accelerate offers an opportunity to pitch to potential investors and corporate partners, securing both customers and capital. This year’s contestants will join an elite group of more than two dozen companies that have premiered products, services, or technologies at VERGE and subsequently found market traction and acclaim. One 2013 VERGE Accelerate participant, Owlized, has continued to attract the industry spotlight with its infrastructure visualization platform. “VERGE Accelerate opened doors to strategic partnerships and advisors that in turn helped us close our first few significant deals. For any early-stage startup, it offers crucial, unfiltered advice from an A-list of knowledgable people,” said Aaron Selverston, founder and CEO of Owlized. The finalists were selected from a diverse pool of applicants representing innovations and disruptions in area such as urban mobility, food production, or energy management. The 12 finalist companies are: Swiftmile, FreeWire Technologies, Kakaxi, TransitScreen, EiP Technologies, Inc., Ibis Networks, Rogue Rovers, Voyage Control, FarmX, Foodful.ly, and 10Power. The finalists’ presentations will be reviewed by industry experts, including Andrew Bebee of Obvious Ventures, Rhonda Clark of UPS, Danny Kennedy of CalCEF and Nancy Pfund of DBL Investors. While audience members, both in the room and online, will cast the deciding votes, the industry experts will offer insight into which business models hold the greatest promise for disruption. FarmX recently travelled to China to participate in Finals of the Global Innovation Awards. FarmX was honored to finish in the Top 10 of 21 teams competing in the finals, out of a total pool of 3000 startups that applied to the competition. “SkyTeam FarmX was selected as one of the Top 21 (out of 3000) startups to participate in the final event of the Global Innovation Awards in Beijing on 25 August 2015. FarmX has worked to assist farmers maximize their productivity and reduce costs with a modern FarmMap that monitors soil, plant and environmental variables. The Global Innovation Awards offered FarmX the opportunity to visit the Hangzhou Dream Town, an incubator space with 34 buildings, over 100 startups and Alibaba’s official Incubator. The team was also able to visit several leading Chinese Tech companies: Baidu, Alibaba, Foxconn, JD.com. FarmX has been accepted into the UC Berkeley SkyDeck cohort for 2015. FarmX is proud to join the accelerator! SkyDeck Mission: SkyDeck accelerates technology, science, and disruptive business startups. Our startups have direct access to the massive resources of the UC Berkeley ecosystem. We seek talent and unfair advantage. 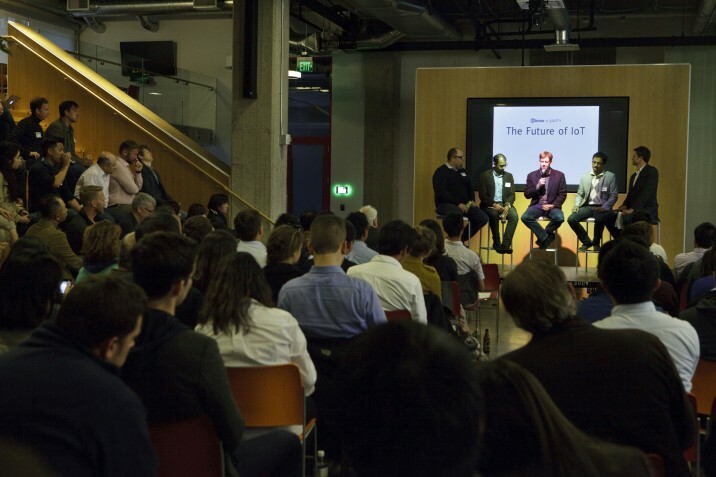 On 10 June 2015, FarmX CEO Sanjay Rajpoot spoke to the San Francisco FoodTech community at Parisoma’s Think+Act event. He discussed the role of AgTech startups, farming and the FarmMap in meeting the needs of the planets estimated 10 billion inhabitants by the year 2050. The farm might seem like the last destination for futuristic technology – even in Star Trek the vineyard is depicted as a space of tradition untouched by time – but, perhaps unsurprisingly, this area is rife with opportunity as climatological challenges are being met by innovative hardware and data solutions. One of our Think&Act presenters, FarmX makes soil probes that sense moisture levels and connect to the cloud, so that farmers can track water consumption in real time. Their technology allows for the tracking of moisture levels over time so that farms can not only respond to acute soil conditions but employ predictive analytics to optimize their watering and fertilization practices – a need becoming increasingly important as drought conditions worsen. FarmX is proud to announce its partnership with Ayrstone to bring our FarmMap products to their existing customers. Ayrstone’s AirMesh Hub and associated products bring wireless connectivity to the farm and are the perfect complement to our FarmMap system. We’re proud to work with Ayrstone as fellow members of the RoyceLaw AgTech Incubator. FarmX: Listed as Top IoT Startup of 2015!! FarmX is proud to rank #3 on the list of the Top 8 IoT startups of 2015! FarmX is committed to helping farmers get the most out of their farm using FarmMap, the first farm health monitoring system of it’s kind and is affordable enough for any grower. FarmMap continuously monitors the farm, providing real-time information on soil and crop health information to grow the most with every drop of water. FarmX was founded in 2014. Sanjau Rajpoot, co-founder and CEO of FarmX, was one of the fireside chat speakers at the event. Prior to FarmX, he was the founder and CEO of Sustainable Microfarms. Sanjay Rajpoot, CEO and Co-founder of FarmX, believes the future lays in enabling agriculture to enjoy the manufacturing efficiencies other industries achieved decades ago. It’s often difficult for startups to acquire early customers, build case studies, and get traction, particularly if they have little formal agricultural experience or relationships. “Farmers cannot tolerate the downside risk that an investment may fail to deliver, so they will wait until the benefits of a solution are precisely known before committing capital,” points out Rajpoot. After a short commercial, this video illustrates what is at stake if California fails to resolve its water issues. Royse has so far announced 11 of his 15 startups. They include FarmX, a company developing a real-time farm health-monitoring tool; Ayrstone, which is developingoutdoor wireless networks for farms; AgRite, a startup that has created an automated wireless fertilizer injection and irrigation system; and RapidBio Systems, which is working on a handheld pathogen detection system. He’s hopeful that the incubator’s mentors, who are closely involved in the agriculture industry, can help with introductions. “Farmers in [Central Valley farming community] Salinas—the last thing they want to see is another sensor salesman. They want to see someone who’s credible, who they know and trust that says this is state of the art,” he says.